I want to give playing cards as guest gifts at our wedding. I only want to spend around $1 per item and have found a lot of site which will send you a sticker to paste on their plastic card decks. I figured I could make even better stickers myself, so does anyone know where I can buy bulk good quality playing cards that come in a plastic case? Please don't do this. 90% will go in the trash. I don't know anyone who kept the ones my friend gave out for her wedding 3 weeks ago. Everyone threw them away. Buy bulk candy or chocolates and tie them in a bag. That's far less than $1 a person. However, I would not do this at all. Sorry to say, but most people will throw these away. 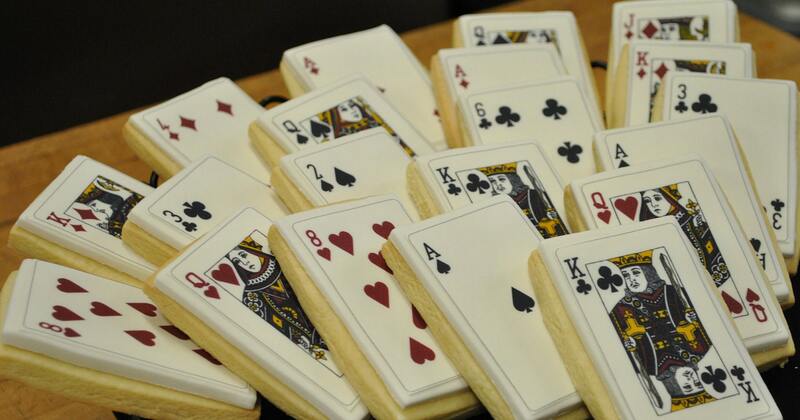 What if you got cookies decorated like playing cards. THAT people would be able to enjoy. People who play cards already have cards. People who don't have cards don't have them because they don't play cards and they figured out their computer can deal out a hand of solitaire faster. Since it seems you're on a budget, just skip the favors altogether. Favors are not required. Most people won't even remember whether you had a favor. If you're hell-bound and determined to spend money to give a favor, then give one where most of your money won't end up in the trash and buy some bulk chocolate and some glassine bags and call it a day. Seconding southernbelle's idea for cookie cards. Yum! I would prefer this over a stack of playing cards which would honestly probably go into a drawer somewhere in my house and never be used. I also say skip this. Give chocolates or cookies instead. This could be a compromise. I agree to go another route. You are just wasting your money when you choose favors that people are not likely to want. Does anyone have a link for where to buy these cookie cards?? Personally I can't stand cheap cards. I do like to play cards but I will spend a little more to have nicer cards (and it's not like they don't last). Not trying to be a snob, there's just... definitely a difference. So I think a cheap deck would likely be wasted on the people who actully do play cards, and of course, equally wasted on those who don't. I would say either go with a little chocolate or other little edible or do not have favors at all. Cards seem to be a waste, in all hinesty. Favors are not needed, after all. I know this is an old thread, but I wanted to share for anyone else who may be searching. We got our playing card favors from Nice Price Favors. They sell the cards in plain plastic cases for around $0.60 to $0.75 depending on how many you get. I wanted to go this route and create our own stickers to match the rest of our stationery, but it ended up being more economical to get the cards that already come with stickers. I don't figure our guests would notice the difference. I think it's a decent option for a favor. Not all of our guests will want to dance, and they'll appreciate having another option for a social activity during the reception. I don't expect anybody to take them home with them and keep them forever (though a few of our guests collect playing cards and probably will). For less than $1 a deck, they're not going to be the highest quality, but they'll be great for a few rounds of euchre. As someone who collects playing card decks, I wouldn't even want this. Better off to go with chocolates. Yeah, it is called having a conversation. I am sorry, but if I saw my guests playing crazy 8's or black jack I would be super concerned that my wedding was boring as hell. It's another option in addition to just chatting. You can have a conversation and play cards at the same time, too. Especially during the cocktail hour, before the dancing starts. I guess it just depends on your definition of fun. I understand the merit of edible favors, but I'm already serving plenty of food throughout the reception. The only time I've appreciated an edible favor any more than a non-edible favor was when the hosts didn't serve enough other food.